Ramping up their return, the band have now confirmed what their next album will be called - as well as a kung fu themed video for Handsome. One of our most anticipated albums of 2015 now has a title: English Graffiti. 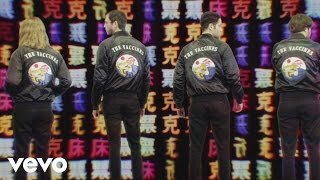 The Vaccines have confirmed that's what their third album will be called, confirmed at the same time as the band released the fun new video for Handsome. Justin Young told Radio X's Danielle Perry that Handsome was recorded live in the studio, which was an exception on the new album. "It's one of the last songs to be written for the record, about two or three months ago. It's taken me about a year to have the balls to write a traditional Vaccines-esque song. With songs like this you'd be a fool not to record the basis of it live. Going in we were quite keen not to make a live record as we'd done that twice before, but with a song like this you have to. You can see the video to Handsome above. Justin says of the clip: "It was really fun to make. We shot it in the middle of the night in this warehouse in New York, it was freezing! I like the ridiculousness of the video, it takes place in another world. And I think music should transport you to another world." Tonight the band will make their long-awaited return to UK stages when their secret London show takes place. They've promised to play some material from English Graffiti for fans. The band will also be playing an intimate show for War Child's Passport:Back To The Bars series of gigs.